A classic-sounding and classic-feeling, versatile guitar that any player needing to cover a huge range of styles will lap up. We certainly did. Price, build quality, broad range of single coil/clean humbucking sounds, feel, playability and style. Placed between PRS’s Asian-made SEs and its core-level US models, the S2 Series (also made at PRS’s US factory but using PRS-design ‘import’ hardware and electronics) isn’t simply about offering affordable versions of PRS’s classic electrics. By design, the S2 range has a different player in mind, one who’s less bothered about PRS’s posh aesthetic and wants a working guitar to use and abuse on stage, night after night. 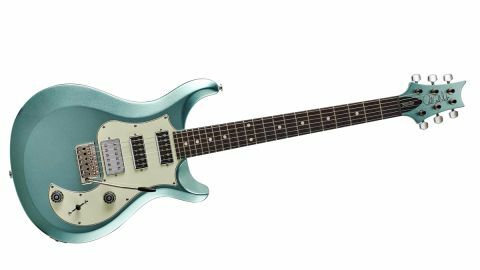 This year’s only addition to what is now a 16-strong, five-year-old range, the S2 Studio takes its name from the original hum’-single-single PRS Studio, made between 1988 and ’91, and which returned for a similarly brief period between 2011 and 2013. The HSS format was also offered as an option on other models such as the Studio Package, but three-pickup guitars - HSS or dual- humbucking guitars with a middle-placed single - have always been a relative rarity for PRS compared with its dual-’bucker format. John Mayer’s ultra high-end Super Eagle put the style back on the map, leading to this year’s core-level Special Semi-Hollow Limited Edition, which places a single coil- sized Narrowfield humbucker between its two standard-sized humbuckers at the bridge and neck. Then there’s the 2017 revamp of the 513, the 509, and let’s not forget the three-single coil Silver Sky. to the demand for that Silver Sky - PRS has been pretty slow to actually ship more than a handful. Technically, too, the S2 Studio is also a ‘limited’ model: not limited by numbers but by dealer orders placed between 16 January to 31 March 2018. Based on the S2 Standard 22, which PRS refers to as a “bare-bones workhorse”, it’s all mahogany with a good weight of 3.32kg/7.73lb. It also has that familiar outline, the S2 style, SG-inspired body chamfers (rather than a carved top), and the hallmark treble cutaway scoop with a slight rib-cage contour on the back. Incidentally, under the mint-green scratchplate, the 44.6mm thick body is routed for three full-size humbuckers. To make the S2s more affordable, the neck is three-piece (not one piece) with a bird-free, unbound rosewood ’board peppered with over-sized white dots. The Frost Green Metallic might not be to everyone’s taste, but it certainly adds a very retro-like style, not least with the abundance of shiny nickel plating, which really is the antithesis of the highly figured 10-tops or fancy bird inlays PRS is known for. If this colour doesn’t float your boat, then there are four others to choose from. Along with the perfectly serviceable hardware - steel-block vibrato and top-locking tuners - the main draw here is the pickups taken from the Starla (coil split-able bridge humbucker) and the Vela with two Type-D single coils. In appearance, these single coils suggest the old DeArmond-made Gretsch ‘Dynasonic’ pickups with six magnetic slug polepieces and a second row of six smaller diameter slot-head screws. On the original, these smaller screws adjusted the height of the rod magnets; here, they don’t adjust anything. The Starla pickup is a full-size humbucker with six slug poles and six slot-head poles, both rows visible through the cover. On the Starla, those slot-head poles sit closest to the bridge, while here, as with the Vela, it’s reversed and it’s that slug coil that dominates when split. We get a master volume with treble bleed cap, master tone with the usual 0.033 microfarad tone cap, plus a pull-switch that primarily voices the bridge-facing single coil of that Starla humbucker via a partial split achieved with an additional 2.2kohm resistor. If the pickup complement is unusual, so, subtly, are the sounds voiced by the five-way lever switch. It’s Strat protocol, except the middle position, which doesn’t voice the solo middle pickup but the bridge and neck pickups, giving a more classic dual-pickup mix - and made especially versatile as that bridge pickup can be split creating eight basic sounds in total. Nice, too, that the lampshade knobs and the shaped switch tip are proprietary PRS designs and not the off-the-shelf parts that so many use. Even the vibrato arm is now black-tipped and follows more closely the shape of the arm used on the core-level models. Even before you plug in, this is classy guitar making: functional, gig-ready and with a definite eye on style. There is a unity to the S2 stable in that all models use the same pattern regular profile, “similar to the traditional regular neck found on guitars made in the late 80s at PRS’s former Virginia Avenue location”, states PRS. It’s the narrowest nut width offered by PRS, but is only 1/32nd of an inch (0.794mm) smaller than the Pattern or Pattern Thin (previously the Wide Fat and Wide Thin). It’s little to get het up about, not least that our sample measures 42.82mm at the nut with quite a usual taper, depth-wise, from 21.9mm to 24.1mm between the 1st and 12th frets. Put simply, this Pattern Regular feels like home, very subtly V’d in the lower positions, rounding out as you move higher up, and bigger in the hand than the Pattern Thin you’ll find on the current CE 24 bolt-on, for example. Set up with a virtually straight neck and PRS’s standard 1.6mm on both treble and bass sides at the 12th fret, it’s an effortless player. With its all-mahogany construction, you might believe you’re going to hear all classic Gibson-like grunt. But there’s a good ring and resonance, no doubt helped by the steel-block vibrato, that seems to nod much more in the direction of Fender. It’s slightly lighter and crisper, acoustically, than a new bolt-on CE 24. But, plugged in, we move further away from more typical PRS voicings and, like the Vela and Starla, if lower output, cleaner tones are your bag, pay attention. The neck-placed Type-D has a Strat-y percussive attack, but slightly rounded, smoother in the high-end, it’s slightly less raw. It’s little surprise, then, that both position 2 (bridge/middle) and 4 (middle/ neck) on the five-way do pretty good ‘hollowed’ Strat-like voices. However, neither is over-sharp, while the middle position’s Tele-like width really suits this platform, giving a third mix flavour that can be thinner, like the bridge/middle mix, with that partial coil-split engaged. And certainly where so many coil-split bridge pickups on their own sound a little over-thin, here it’s a good match for those mixes, although there’s no lack of highs and quite a stringy, open voice. In full ’bucker mode the bridge pickup adds a slight kick and smoother power but with plenty of clarity. Gretsch-y? Yes, but with more body, though considerably less ‘rock’ than the 85/15s of the CE 24. If you want to chase those slightly grittier and textured overdrive sounds that inform styles from Americana through to alt-rock and modern country heat, it does it rather well. We spent far too long playing this Studio alongside a couple of other S2s, old and new CE 24s and a couple of Strats. There is little doubt that not only does it hold its own, but along with the stable vibrato performance and general in-tune-ness it - importantly - offers a different and distinct voice. It’s not a Strat (although it certainly has a Strat-y flavour), it’s not a typical PRS, and it’s different enough from the Vela or Starla to have substantial validity. The different style - not to mention exclusive designs such as the Starla, Vela and now this Studio - gives the S2 Series a rather different identity to either of PRS’s core-level guitars or the lower-tier SEs. Yes, there is plenty of ‘PRS’, yet the polarising bling (for some) of the high-end core guitars is absent here. The colour choices have a definite retro aesthetic and, overall, the Studio displays a vintage-y style with sounds to match. Yes, the Starla and Vela go for a similar sonic space, but here we’re not bothered by the Starla’s lumpy Bigsby or the altered outline of the hardtail-only Vela, plus we have that middle pickup contributing to the more Strat-like mixes. It’s a tasty dish with a pro-level, hugely detailed build. Price-wise, it’s bang on the money (and has a street price of £1,429). This means it slots into what is a pretty exciting real-world area, which has the benchmark Fender Professional range on the one hand, contrasted by more progressive guitars such as Ibanez’s AZ models. The S2 Studio certainly holds its own, not least for the player. It’s a classic-sounding and classic-feeling, versatile guitar that any player needing to cover a huge range of styles will lap up. We certainly did.